"To fight for chronic pain suffers to have quality of life and not be treated like drug addicts"
PLEASE HELP ME FIGHT FOR THIS CAUSE I TRUELY BELIEVE IN AND THAT IS PERSONALLY AFFECTING MYSELF AND MY FAMILY ! I DONT THINK ITS FAIR TO TREAT EVERYONE AS DRUG ADDICTS! THIS NEW LAW CRACKS DOWN ON PEOPLE WHO GET PAIN MEDICATION AND ABUSE IT BUT LEAVES THE PEOPLE WHO DEPEND ON THESE MEDICATIONS LIKE MORPHINE TO HAVE QUALITY OF LIFE AND WHO NEED THESE MEDS TO FUNCTION ! IT NOT FAIR PEOPLE LIKE MYSELF AND OTHERS HAVE TO SUFFER BECAUSE THE DEA AND DOCTORS AND INSURANCE WANT TO CRACK DOWN ON THE DRUG ADDICTS BUT WHERE DOES THIS LEAVE CHRONIC PAIN SUFFERS? IT LEAVES US BEI G PUNISHED BECAUSE OF THE PEOPLE WHO POP PILLS TO GET HIGH INSTEAD OF TAKE PILLS TO GET OUT OF PAIN SO WE ARE ABLE TO JUST GET OUT OF BED AND DO DAILY TASK LIKE GETTING DRESSED AND BRUSHING OUR HAIR AND TEETH AND GOING THE RESTROOM ! 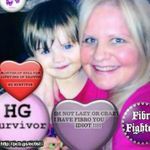 PLEASE HELP ME FIGHT IN THIS FIGHT TO CHANGE THE LAW FOR PEOPLE WHO SUFFER FROM CHRONIC PAIN I CANT DO THIS WITHOUT YOU ! About Me I stand up in what I believe in I fight for what I believe is right ! I am standing up for people who suffer from chronic pain to have the right to be on opiate pain medication whatever the about may be to get them out of pain and function ! I don't think its fair that people who abuse the meds to continue and the people who are really in pain and suffering LOSSE there MEDS because of this new law ! What Gives Me Hope My beautiful baby and step daughter and husband my family my mom is my hero she been there though it all !